Quality tippet is crucial when you want to present a fly as naturally as possible. 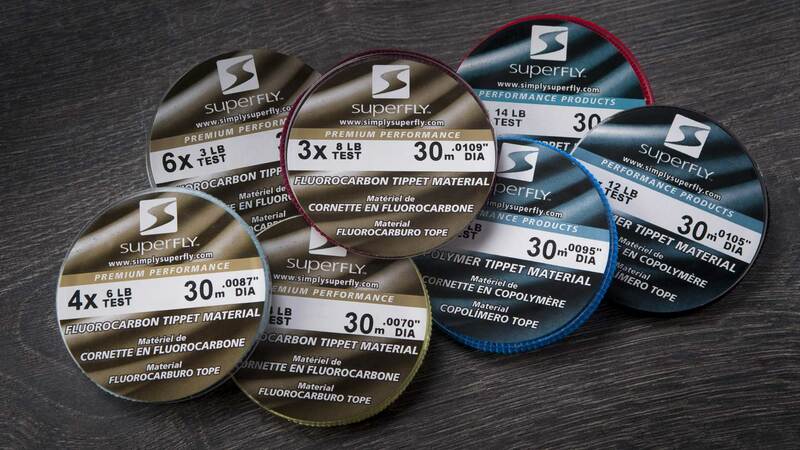 Superfly offers two lines of tippet: Performance and Premium Performance, each in 30-metre lengths. This line is made of a Copolymer material that is a perfect blend of strength and flexibility, making it ideal for practically all fly fishing applications and conditions. Sizes range from 0X to 6X with various diameters and test strengths. Our Superfly tip: Be sure to match your tippet size and strength to the species of fish you are going after. Made of high-quality Fluorocarbon, this line is perfect for all sub-surface presentations as it becomes virtually invisible underwater to help increase your catch rate. Sizes range from 0X to 6X, with various diameters and test strengths. See our leader and tippet size chart.